Please note that the content of this book primarily consists of articles available from Wikipedia or other free sources online. 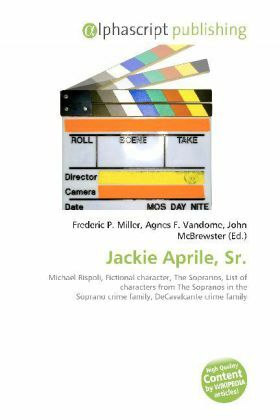 Giacomo "Jackie" Aprile, Sr., played by Michael Rispoli, was a fictional character on the HBO original series The Sopranos. He was the first Acting Boss of the DiMeo Crime Family, after longtime reputed Boss Ercole ''Eckley'' DiMeo was sent to prison in 1995. He is based on DeCavalcante crime family acting mob boss Giacomo "Jake" Amari. According to Sopranos; A Family History, Giacomo Michael Aprile, Sr. was born in 1955, was a close friend and contemporary of Tony Soprano and they came up through the ranks of the DiMeo Crime Family together. Jackie''s older brother, Richie Aprile, also stepped up in the same crime family. Jackie was also the brother of Liz La Cerva and thus the uncle of Adriana La Cerva. Jackie and Tony, along with Silvio Dante and Ralph Cifaretto, were in a minor-league crew as kids. Around this time, Jackie had the idea to rob a card game held by then-capo Feech La Manna and, in Ralph''s words, "step up to the A-league." Ralph contracted gonorrhea and was unable to rob the card game. However, Tony, Jackie and Silvio took it down. Bitte schreiben Sie uns Ihre Meinung zu: Jackie Aprile, Sr.